At a ceremony today at the headquarters of the Kyiv Patrol Police, the Head of the EU Advisory Mission (EUAM) Ukraine Kęstutis Lančinskas underlined that better traffic policing will contribute to building trust in the police, reduce the potential for corruption and ultimately play a role in reducing accidents on the road. 25 officers in the Kyiv Patrol Police have just completed a three day training session conducted by EUAM staff in EU best practice in traffic policing. The training focused on how to stop vehicles on public roads while maintaining the flow of traffic, communicate better with traffic offenders, issue fines in a way that reduces potential tension and use modern technology to minimise the time spent issuing a fine. The police officers trained by EUAM will now be expected to train their colleagues in Kyiv and the surrounding region in these techniques. 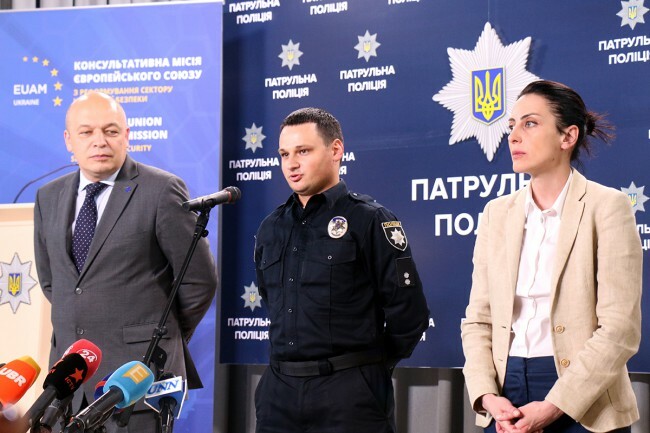 To assist the Kyiv Patrol Police in improving traffic policing, EUAM is also providing 91 machines for printing fines and 4,500 thermal paper rolls. This will make up the current shortfall in mobile printers in Kyiv and allow the Kyiv City Police to issue a machine and a year’s supply of paper to every patrol vehicle assigned to deal with traffic violations. While issuing a hand-written fine takes about 20-30 minutes, a modern system of electronic tablets connected to mobile printers reduces this time to 5-7 minutes. This minimises opportunities for corruption and also gives police officers more time to interact with drivers and communicate the importance of safe driving in reducing the level of accidents, which remains comparatively high in Ukraine.